1) More Secure Than Businesses – Unlike a company, real estate holds (and appreciates) in value. 2) Cash Flow Opportunities – Many real estate projects offer monthly cash flow. 3) Short, Mid-Term & Long Term Investment – Depending on the project, investors can select deals that fit their investment portfolio and strategy, based on short to long-term investment. Once you have a real estate business opportunity, the first step is to get seek funding (OPM). This is the stage to consider a professional real estate business plan writer. 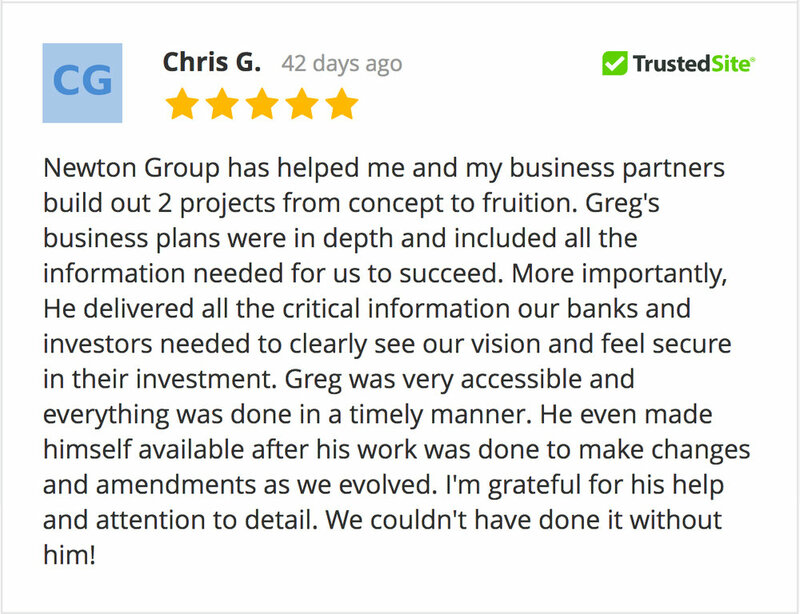 About Greg – Greg is the founder of Newton Group Marketing, where we write professional business plans to help clients solidify investment. We regularly work with real estate investors and projects throughout Canada the US. Schedule a free consultation to see if we would make a great fit. The fact you’re reading this you are probably seeking an investor (or debt financing) for your real estate opportunity. At this stage, most people think the opportunity should speak for itself – that it’s a no brainer – that any investor can see your project is a great investment and will make money. In most cases a real estate business plan is used to get all team members on board with an investment. It addresses doubts and give all investment details, but most importantly it provides trust for other partners. This is also true for a bank loan manager whose job is on the line when selecting a business loan applicant. This is even more true for larger investment amounts. A sharp, properly written business plan provides reassurance for all stakeholders involved. No business opportunity is ever too simple to require a business plan. Even the most straight-forward real estate deal may seem dead easy at the beginning, but then accumulates complications as you proceed. Every project has multiple moving parts, financial details and timelines. Your business plan allows you to clarify all the details, lay out the profit potential and state proposed contingency plans in execution. A professional business plan separates the pros from the amateurs. It transports you from someone with a “pie in the sky” opportunity, to someone with a real business proposal. Presentation is so key in business, and a real estate business plan commands attention and respect for your project. Each week investors receive poorly written business plans, so professional plans stand out and are given special attention. What Makes an Effective Real Estate Business Plan? Let’s face it – the purpose of a business plan is not to look sharp or sound professional. It’s to successfully get funding. So what are the key ingredients to an effective real estate business plan? Many entrepreneurs make the mistake of assuming everyone can see their vision like they can. Or they make leaps in the business plan that seem obvious in their mind, but readers won’t always make the same leaps. Instead they just feel mistrust. The solution: backup all your numbers. Use solid sources. Show it. Prove it. Do you expect your first time doing a bathroom tiling home repair job will turn out as good as if done by seasoned tiler? Of course not. It’s the same with business plans. Non-professionals always omit areas they are unsure about and glaze over the difficult details, hoping nobody will notice (we do). A professional real estate business plan writer will flush out all the details, provide a rigorous market analysis. He/she will go through tedious market research work and provide a proper financial analysis of investor presentation-grade quality. An effective real estate business plan (a) provides all the essential details of the investment while (b) respecting of the reader’s time. This means key information is concise. Each paragraph is meaningful and adds to the investor’s decision-making process. This looks like clean charts and graphs that quickly convey the important information. We provide our clients with complete plans that outline your full real estate project in detail, ready for investor presentation. Each plan includes (a) full professional market analysis, (b) 3-yr pro forma financials, (c) investment details (ROI). Each plan is uniquely tailored to your project and to successfully achieve your investment goals. What city do you live?